Aitutaki's beautiful lagoon measures 12km long by 15km wide, with numerous sandbars, coral ridges and 21 motu (small islands). The warm, clear waters offer superb snorkelling and diving, with an array of coloured corals and tropical fish. 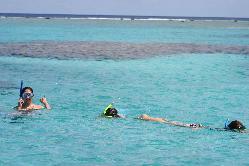 Snorkelling is available from the beach or on lagoon cruises. Snorkelling gear is available from some hotels and on lagoon cruises. We recommend that if you have snorkelling gear that you bring it with you. 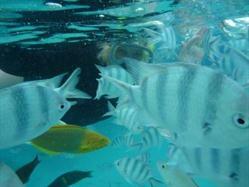 There are several lagoon tours available that all include snorkelling and lunch. Costs range from $85-$100 with a choice of large to smaller boats. There is information in the diary in the villas as to what other guests have enjoyed. A tour guide, who runs a diving tour business out of Britain and who has led diving tours all over the world, describes Rarotonga and Aitutaki as some of the best scuba diving locations he has ever come across. John Byatt believes the Cook Islands is completely undiscovered as a diving location. The year-round warm water with temperatures of between 23º and 30º, the easy accessibility and the circular shape of the island of Rarotonga allows divers to go out in virtually any weather to take advantage of shelter from rough wave action. There is a huge variety of coral and splendid visibility of 100 to 200 feet. There is a wide range of diving sites including caves, wrecks and simple submarine terrain for beginners such as sand rivers. The Aitutaki lagoon has an average depth of 35 feet and has an array of coloured corals and tropical fish. The shipwreck of the Alexander, which sank in the 1930s is also of interest. Cost for a four-day training course for beginners is about US$230 and students can select different types of certification. Training is available in Aitutaki. All the dive companies have equipment for hire but it is wise to bring one's own snorkels, masks and fins.